What are the tools required to support the disciplined approach to IT Asset Management? "What are the tools required to support the disciplined approach to IT Asset Management?" IT Asset Management: Why is it Necessary? Implementing the IT Asset Management Discipline (ITAM) is a set of business practices that incorporates IT assets across the business units within the organization. Without establishing IT asset management processes, organizations can’t effectively manage the diverse and mobile portfolio of IT assets. Visibility to total cost of maintaining the IT infrastructure. Visibility to the availability of resources. This whitepaper discusses about the key requirements for implementing the IT asset management discipline and guides you in choosing the solutions and available tools to manage the IT assets. What is the need of IT Asset Management discipline? What is ITIL? What are the key benefits of IT Asset Management? What are the common challenge of implementing a Software Asset Management program and how to overcome them? 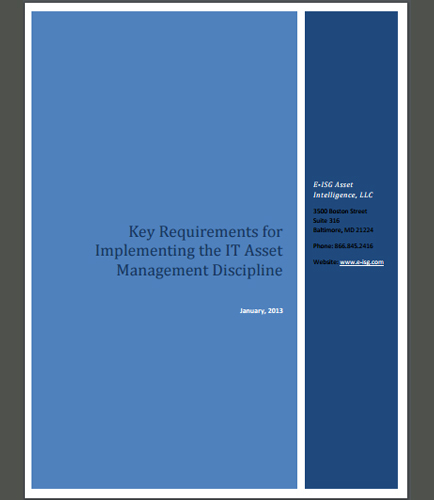 What are the requirements for a disciplined approach to IT Asset Management? The most flexible Business Intelligence (BI) platform, QlikView, allows its users to gain valuable insights by understanding the fine line between the relevant data and the redundant data. It stimulates unrestricted analysis of application data, thus helping users make timely and accurate decisions. If you are already aware of the above mentioned BI platform, then here’s an investment solution that would add on to the values of your Qlik investment. This white paper reveals the concealed facet of the same BI tool that could be coherently integrated with an extension facilitating freedom and flexibility for everyone in the company, in terms of analyzing planning data. This QlikView white paper unfolds how you can enhance your Qlik system with data capture and write-back to the database as well as specific planning functionality such as easy top-down planning and driver-based bottom-up planning, unifying Business Intelligence (BI) with Corporate Performance Management (CPM). In the computer industry, an enterprise is just another name for a business; the term is often used to describe all the organization that uses computers. Enterprise is a term that encompasses small and big, private, public businesses, corporations, government bodies, and possibly unique sorts of business affiliations. You will often come across the usage of the word “Enterprise” when examining about new organizations and different organizations.